The motion bracket is now bolted on to the fireman's side of the chassis and is looking rather pleasing in a coat of new black paint. 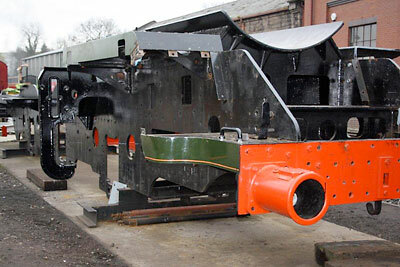 The motion bracket for the other side of the loco is cast and machining will shortly commence. The footplating around the front end continues to take shape. We have the tread plates for the various footsteps and have recently received the backing plates, laser cut to shape, for these footsteps, front, rear, cab. Some of these backing plates require bending to final profile and we are busy on this job. To relieve the boredom of the interminal machining of manganese liner plates for the horn guides and horn blocks Richard has spent a couple of days on preliminary drilling of the fork ends of the cross stays. Final boring to size and fitting of bushes will proceed later. The dedicated account stood at just under £16,500 on February 23rd. We will be vigorously promoting the 82045 Wheel Appeal over the coming months, both on and off the SVR. The new leaflet has been produced and will form an appeal insert in the March issue of SVR News. The decision has been taken to have the driving wheels cast first and in theory we now have enough in the pot to have a trial casting done (we estimate about £8,000-£9,000 plus VAT per wheel), but would prefer to wait until the finance is in hand to have all six wheels cast. In addition, we will need to obtain axles and tyres, and will shortly be ascertaining costs and the likely lead time for the procurement and machining of these items so that the necessary orders can be issued. It seems incredible that the AGM is nearly upon us as we stagger out of another long winter! Please don't forget that this year's AGM is to be held on Saturday 31st March 2012 at 14.30 in the upstairs lecture theatre at Kidderminster Railway Museum. We are hoping for a good attendance and will certainly have a lot to talk about, so please make every effort to attend - and bring a friend (or friends) by all means. 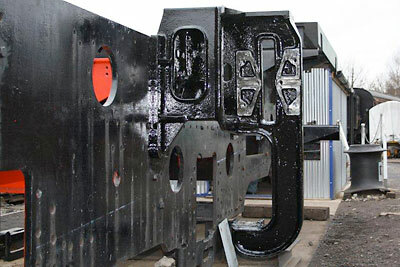 The recently cast and machined motion bracket on the fireman's side of the loco.